Unhealthy Obsession with Cars: This Could Be a Buick?! This Could Be a Buick?! 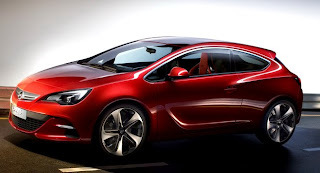 Now that we've seen Buick go all the way down-market with their Delta-based Verano compact sedan (Delta is the chassis we see under cars as varried as the Chevy Volt, Cruze, the not for sale in the US Orlando, and the Opel Astra) - is it only a matter of time before the sportiest of Astra's makes its way across the pond? What you see here is the Opel GTC 'concept' which is a thinly veiled version of the 3-door Astra that will go on sale soon. Picture this with a variation of the Verano's waterfall grill and you might imagine this being a sporty coupe that would serve to get those younger buyers Buick is craving into the showrooms. This could be a worthy little brother to the Regal coupe we keep hearing rumors is on its way to Buick as well.